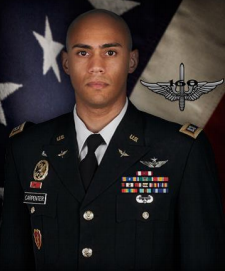 Major Clayton Carpenter, 30, died January 15, 2014, when his MH-60M Blackhawk helicopter crashed at Hunter Army Airfield, GA, during a night training mission. MAJ Clayton Carpenter was born 12 August 1983 in Brooklyn, New York. He was commissioned as a Second Lieutenant in May 2005 from the United States Military Academy at West Point, New York. After graduating, he was assigned to Fort Rucker, Alabama, for Initial Entry Rotary Wing Training.After completion of the Aviation Officer Basic Course, he was assigned to 2nd Battalion, 25th Aviation Regiment at Wheeler Army Airfield, Hawaii, and deployed in support of Operation IRAQI FREEDOM (OIF) 06-08. He further served as a Headquarters and Headquarters Company (HHC) Commander and deployed in support of OIF 09-11. He arrived at the 160th Special Operations Aviation Regiment (Airborne) in September 2012 for Officer Green Platoon and served as an MH-60M Platoon Leader in C Company, 3rd Battalion, 160th SOAR(A). MAJ Carpenter’s military education includes the Initial Entry Rotary Wing Course; Aviation Officer Basic Course; UH- 60 Flight School XXI; Aviation Captains Career Course; Air Assault School; Aviation Tactical Operations Officer Course; Aviation Safety Officer Course; UH-60M Aircraft Qualification Course; Survival, Evasion, Resistance, and Escape (SERE) Course (Level C); Combatives Level-I Course; and Officer Green Platoon. MAJ Carpenter’s awards and decorationsinclude the Meritorious Service Medal (w/1 Oak Leaf Cluster), Air Medal (w/Numeral 2), Army Commendation Medal (w/Valor Device), Meritorious Unit Citation (w/1 Oak Leaf Cluster), National Defense Service Medal, Iraq Campaign Medal (w/3 Bronze Service Stars), Global War on Terrorism Service Medal, Army Service Ribbon, Overseas Service Ribbon (w/Numeral 3), the NATO Medal, the Air Assault Badge and Army Aviator Badge. He was posthumously awarded the Meritorious Service Medal and the Senior Army Aviator Badge. MAJ Carpenter is survived by his father, Paul; his mother, Colette and brother, Chris.